It was pretty clear that the leak on the overdrive was not down to the screws on the cover plate being loose or the filter (although this has been the cause of leaks in the past). It looked like it was time to change the O-rings on the solenoid. Once the blue plate was removed the solenoid was visible but was pretty stubborn. In the end I had to use a magnet to pull it out, but that still left part of it in the cavity. I had to carefully remove this top-hat part with some pliers as it was nice and tight. 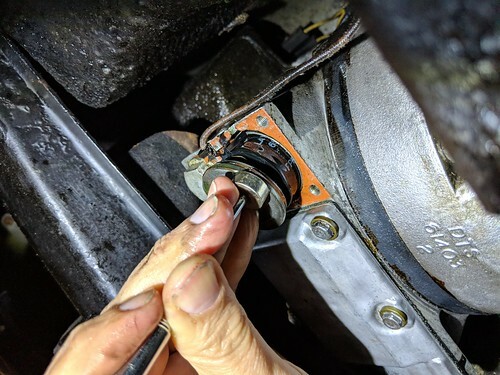 On the bench it is clear to see how it works with a plunger pushing a ball-bearing into the top-hat to stop oil flow and raise the oil pressure, activating the system. There are 3 O-rings to change, one on the top-hat, one on the plunger and one on the base. So far the leaks from the overdrive have reduced significantly.